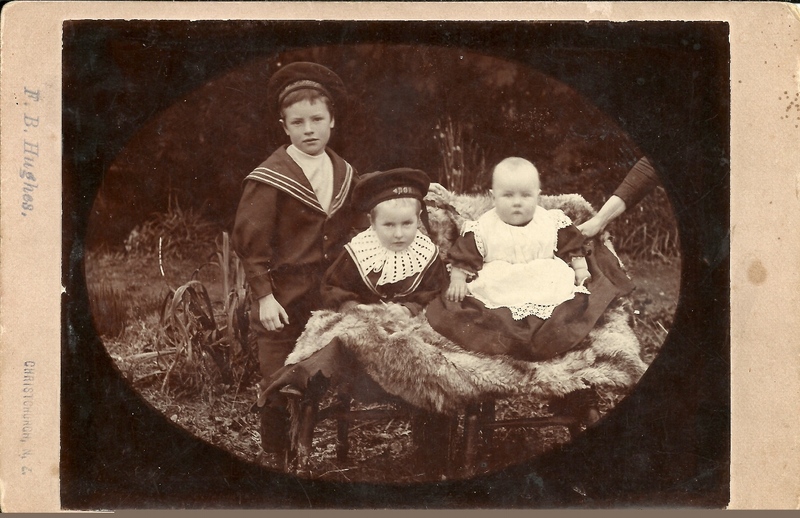 Robin, Wallace and Eric Gray c. 1896. Both Wallace (the boy-child’s great grandfather) and Eric served in WWI. Eric was wounded at Messines on 7 June 1917, and was killed in action on 27 March 1918 in the Somme Valley. Image: Gray family archive, courtesy of Peter Duncan. Today is the 100th anniversary of the start of the Battle of Messines; a World War I offensive by Allied troops that formed the prelude to what later became known as the Third Battle of Ypres. Although the ten day Messines Offensive was regarded as a military success (unlike the later Ypres campaign), it still resulted in around 25,000 Allied and a similar number of German, casualties (1). That included 3700 New Zealanders –700 of whom died (2). One of those, non-fatal, New Zealand casualties was Eric Andrew GRAY — a great grand-uncle of the boy-child on his father’s side. 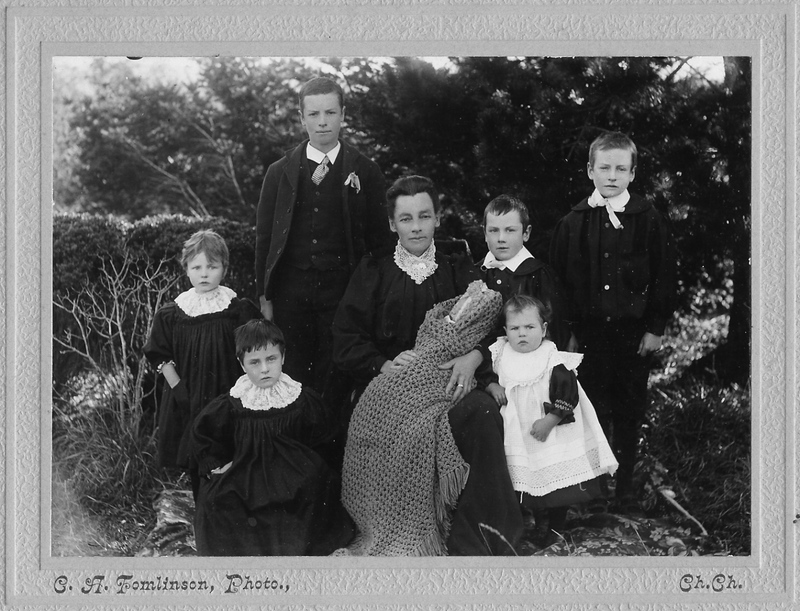 Gray family portrait c. 1902. Standing: from left Ethel, Robin, Eric, Wallace. Seated: Doris, Emily Ann (nee Oliver) holding baby Mavis, Aileen (toddler). Photo: Gray family archive, courtesy of Peter Duncan. Eric was the fourth child and youngest son of Andrew Gray and Emily Ann Oliver. He was born on 20 October 1895 at Hororata, New Zealand and was killed in action on 27 March 1918 near Auchonvillers, in the Somme Valley, France. Before enlisting, in April 1916, Eric worked as a farm labourer for Selwyn County Council. Almost all of what I have learned about family members’ wartime experiences has come from their military records. For Eric’s experience at Messines however, I have an extra layer of knowledge. While recovering at Brokenhurst Hospital in England from his wounds, Eric wrote to his sister Doris back in New Zealand. Although I’ve written about the letter before, (in the post “We got dug in about five feet deep by dinner time and then Fritz started to shell …” ) I thought it worth reproducing here, as it gives a quite detailed account of one man’s experience of that day, exactly 100 years ago. Just a line or two to let you know that I am getting on all right. I received a letter from you the night before we went into the trenches and never had time to answer it. We left camp with all our gear and I tell you we were loaded up at nine o’clock Wed night and arrived at the trenches at half past one in the morning. We had to carry our equipment and forty eight hour rations, water bottle full, rifle and 120 rounds of ammunition and me being a bomber had to carry fifteen bombs each weighing two pounds and one big one weighing fourteen pounds for dropping down dugouts. We also had our oilsheet, a cardigan jacket, towel and soap shaving gear and a pair of socks in our pack and two gas helmets, so you see we were well loaded up. Well when we were going up the trenches Fritz put over a lot of gas in shells. He fires them over and they don’t explode they just break open and the gas comes out and floats whichever way the wind is blowing. Everything was very quiet while we were waiting for the word to go over but just when time was up a big mine was exploded under Fritz’s line which rocked the ground so you could hardly stand up. As we went over our artillery opened fire into Fritz’s trenches and as we advanced they lengthened their range so we were on to him before he knew the guns were firing past him. We took three lines of trenches before we got to Messines and tunnelling uphill all the time. Before we went in we had been shown maps and pictures of the town and each platoon was given its part to clean up but when we got there it was just like a broken brick heap. You couldn’t tell where the streets were or the square or anything. Our artillery was great. The Germans in the town were full up of fighting. They came out of their dugouts and surrendered without a word. Our corporal and I got twelve out of one dugout and then we went down it and there were eight more in the corner. They could easily have shot the two of us but as soon as they saw us they put their hands up and started to yell for mercy and so we took them out too. We came across a case of soda water in bottles and didn’t we get into it as we only had out water bottles full to last us for perhaps two days until the water carriers could get up. Well our job was to clean up our part of the town and then go about one hundred yards past and dig in. The first brigade that is the North Island men were to go four hundred yards past us and dig in and in the afternoon the Australians went eight hundred yards past them and dug in again. So you see we were not so badly off as we were not in the front line. We got dug in about five feet deep by dinner time and then Fritz started to shell and for an hour or two it fairly rained shells but it wasn’t until about half past three or four o’clock when I got my smack. A small shell burst in the trench near me and the flame of the explosion burnt my neck and a piece went in the back of my right shoulder and now I am here but the only thing that I am worrying about is that it will be better too soon. 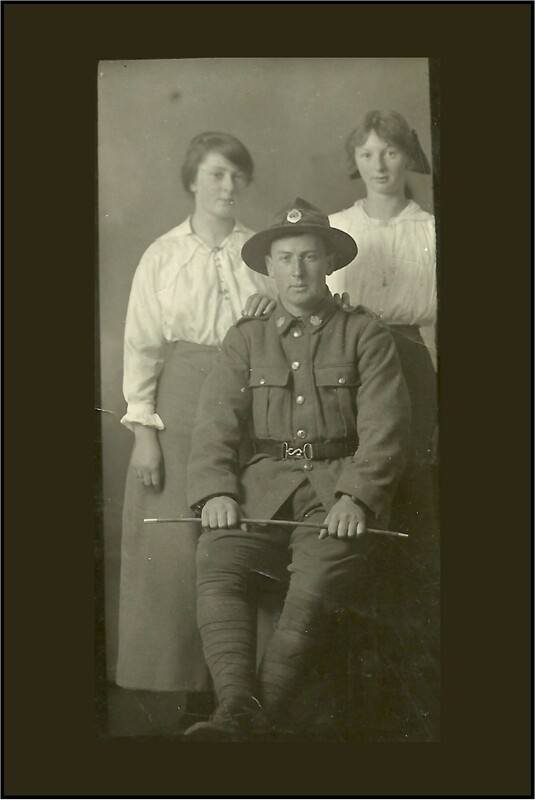 Before leaving New Zealand for the Western Front, Eric had his portrait taken with two of his sisters, Ethel and Doris. He was just 20 years old and within two years would be dead; buried alongside other young men in the Martinsart British Cemetery, France. Enlistment portrait: Eric Andrew Gray (20 October 1895 – 27 March 1918), with sisters Ethel (left) and Doris Gray c. 1917. Image: Gray family archive (courtesy of Peter Duncan). (2) NZ casualty figures from New Zealand History, 1917: Arras, Messines and Passschendaele.